All who have come to the Village of Pu'uhonua O Waimanalo have enjoyed the peace and serenity of this countryside village, nestled next to the Ko'olau and Olomana Mountains. You will understand why Cameron Crowe filmed part of his "Aloha Movie" here. This is a medical political cause for us and the fees barely cover our costs. Part of our fees go toward promoting Native Hawaiian programs. All peoples are welcome! It is a model of ALOHA for the world! In the future, one will be able to walk the paths to the ancient lo'is, taro gardens and fish ponds, and learn about Native Hawaiian culture. 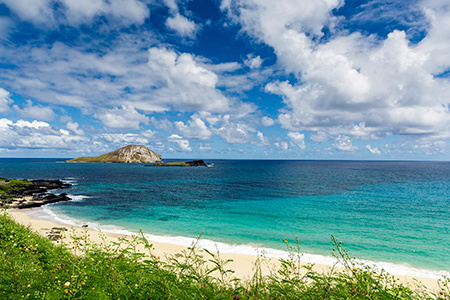 All have expressed how wonderful a place it is to visit and view the windward side and ocean. There are sacred burial mounds in the village where many have been returned to Hawaii from distant lands, so we consider it sacred. The village is also the personal homes of the residents so please drive slow and be respectful.